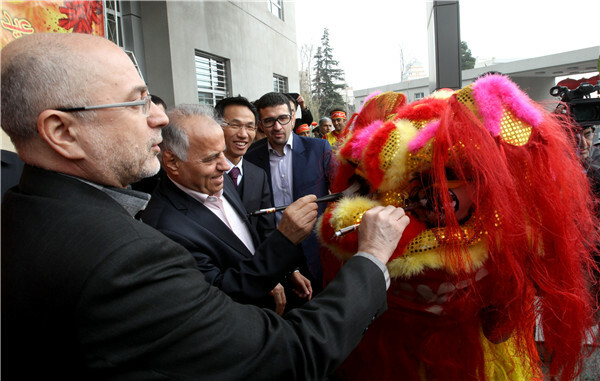 As people in China are busy preparing for the upcoming Lunar New Year, which falls on Feb 8, Alireza Salarian, consul general for Iran in Guangzhou, is arranging to celebrate his fourth Iranian New Year in the South China city on March 20. Chinese Lunar New Year is also known as Spring Festival, as the season signifies a new start from the depths of winter, and the corresponding holiday carries the same meaning in Iranian culture. Nowrooz, as the Iranian New Year is called in Persian, means "new day" and falls on the first day of the spring equinox every year. There are remarkable similarities in the ways Chinese and Iranians celebrate their spring festivals, according to Salarian. It is a time for family reunions in both countries, and people who live away from their hometowns customarily return for a family dinner on the eve of the festival. Fish is a common holiday dish in both countries, as is a version of the saying, "May you get more than you wish for every year." Like the Chinese, Iranians enjoy a weeklong holiday to celebrate the festival, and children also wear new clothes as they accompany their parents on visits to relatives. While Chinese attach scrolls of blessing couplets on gateposts and offer guests nuts and candy in exquisite boxes, Iranians traditionally present an elaborate table setting with seven items starting with the letter "s" in the Persian alphabet. The custom came from Iran's ancient religious doctrine that considered seven virtues as seven angels whose names start with "s". Apart from garlic, vinegar, apples, wheat sprouts and sumac berries, the seven items include Iranian sweet paste made from germinated wheat and dried fruit of the oleaster tree, a type of olive native to Iran. Luckily, Salarian has found little difficulty in buying these Iranian specialties in shops in Muslim communities in the Chinese city. There are about 400 Iranians who have lived in Guangzhou for some time, according to Salarian. The Iranian consulate general will host a gathering in a hotel for them to celebrate the Iranian New Year in March. It is surprising to many Chinese people that there are so many similarities between the two nations' holidays. To promote Iran's culture, the Iranian consulate general in Guangzhou has held exhibitions of Persian carpets and concerts as well as showcasing Iranian food and tourism. "We will continue to work to increase Chinese people's understanding of Iran's culture and customs and interest them in traveling to Iran for a firsthand experience in Persian culture," Salarian said. "It is an important part of Iran's sixth five-year plan to boost its tourism industry. We welcome Chinese tourists and Chinese businessmen who want to invest in Iran's tourism, for example, by building hotels," he said.